The Safety Inspection & Education Act and Health & Safety Act - English is a job safety law poster by the Illinois Department Of Labor. This poster is mandatory for some employers, including public sector employers. This poster must be posted in a conspicuous place where all Public Sector employees will see it. This poster describes the rights that employees have to a safe workplace as well as the right employees have to request an inspection as well as file a complaint if retaliated or discriminated against when exercising right for an inspection as well as what employers must do to keep the workplace safe. It appears you don't have a PDF plugin for this browser. 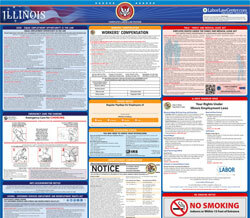 Please see the link below to download illinois-safetye.pdf. actions  and  conduct  on the   job. free  from recogni zed  hazards. standards  issued under  this Act. must  post  this  notice  in your  workplace. place of the  alleged  violation(s). be  fo rw arde d to  OSH A Regio n V .